The social network's VP EMEA talks virtual reality, mobile growth and Facebook's "video explosion"
At the end of June 2015, Facebook had 1.49bn monthly active users, and 968m daily active users. But the social network’s growth is being increasingly driven by mobile devices: it had 1.31bn monthly active mobile users, and 844m daily active mobile users. What does all this mean for Facebook, and for television? 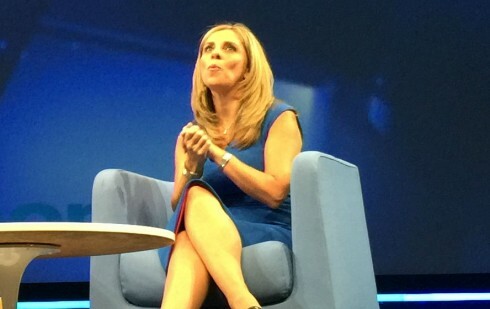 The company’s vice president for Facebook EMEA, Nicola Mendelsohn, took the MIPCOM stage for a keynote today to explain, just over two years after joining the company. She gave a short speech, and was then interviewed by journalist Kate Bulkley. “Time spent online is now eclipsing time spent on television, and yet we live in a golden age of TV,” she said, pointing to the popularity of the smartphone as the key factor in the first of those trends. “The first phone you ever had was probably a brick… and then the phones started to get smaller and smaller and smaller,” she said. Until that trend reversed. “People wanted their phones to get bigger and bigger because it was such an extraordinary creative canvas to look at video and imagery,” said Mendelsohn, noting a corresponding “move from text to visual communications” in the way people use those devices – epitomised through Facebook’s Instagram app, with its 400m active users. “Video is exploding,” she continued, citing a Cisco research suggeting that video will account for 80% of internet data by 2019. “What we see on Facebook today is that there are over 4bn video views every day, and 75% of them are on mobile,” she said. She talked about how Facebook worked with Sky in the UK on the premiere for the last season of Game of Thrones. Facebook had 2.2m people who were enthusiastic about Game of Thrones on its social network, but expanded it through similar shows: The Walking Dead, Lord of the Rings, Deadwood and Borgias to reach an audience of 8.3m people. The night of the premiere, Facebook helped Sky to push out sponsored video and photos to that audience. “Nielsen told us that the ad recall for this was three times the global average, and it drew a massive audience to the premiere,” said Mendelsohn. Yesterday, Facebook launched four new kinds of tools for broadcasters. First: hashtag voting and polling, where people can cast their vote on Facebook in a post or comment, which producers can then take to use in the show. There’s also “native polling” where viewers can give their opinions, even if they’re not voting to influence a show. Also new: video and photo submission, used recently for the Republican presidential candidates debate on Fox, when viewers could submit videos with their questions via Facebook. And a new Facebook Video Gallery feature to help producers curate this incoming content and showcase it online. Mendelsohn also talked about the idea of personalising video with “a Suggested Videos experience” that recommends more videos people would like to watch, when they spot one in their news feed. She also talked up Facebook’s recently-launched 360 videos feature: videos that can be watched in 360 degrees, with partnerships with Star Wars, Vice, Discovery Networks and others. “We are committed, we’ve put some of our very best engineering teams onto working on developing and building out the future of video on Facebook,” she said. Before promising a comprehensive set of rights management systems behind the scenes, to help producers and broadcasters build their businesses. Is Facebook creating TV-like channels on its service? “It’s like my own personal newspaper of everything that matters to me, and everything that is interesting to me in my life,” was how she put it. Mendelsohn said Facebook does not have ambitions to become the publisher and rightsowner of TV-style content. “We want to be a platform for all of you that have incredible content to get to the people who matter to you,” she said. How does monetisation work on Facebook’s platform for video, wondered Bulkley, who also cited Facebook’s Instant Articles initiative for hosting news stories and articles.